Keith's birthday is tomorrow and we decided to celebrate with friends by hosting a dinner party on our recently stoned patio this weekend. We're hosting a BBQ and I've been working on furnishing the patio and getting it set up this week. When we originally decided to redo the patio (it was formerly covered with loose patio rocks and pebbles as filler), we had multiple discussions around building outdoor benches or buying furniture. Keith is in charge of most of the furniture projects, so I let him have a little more say over it, and we decided built-in benches in the sunroom and purchased wooden furniture on the patio would be a nice balance. I tend to over-research any purchase (it took me 6 months to buy a car) so the past month I have checked prices and reviews on wooden, metal, and wicker outdoor furniture from stores like Wal-Mart, Target, West Elm, World Market, Pier One, Crate & Barrel, etc. After a lot of reading and looking at items in person, I decided that the price, quality, and feedback on the Catalina Collection at World Market seemed like the best deal. We purchased an outdoor bench and armchair from the collection, as well as a 9' patio umbrella, Adirondack chairs for additional seating, and a storage bench for the furniture cushions when not in use. We just started receiving all the furniture in the mail this week, and so far, I'm very happy with the quality. I have an outdoor patio table that I purchased during a summer college job at Pottery Barn and it had certainly seen better days. It used to be on our patio at our old rental house so rain and sun left the top and sides off-color and pretty beaten up. I finally decided to clean it up, and yesterday I wiped it down with a soapy cloth, sanded the top and re-stained it with Minwax Wood Finish stain in Dark Walnut. 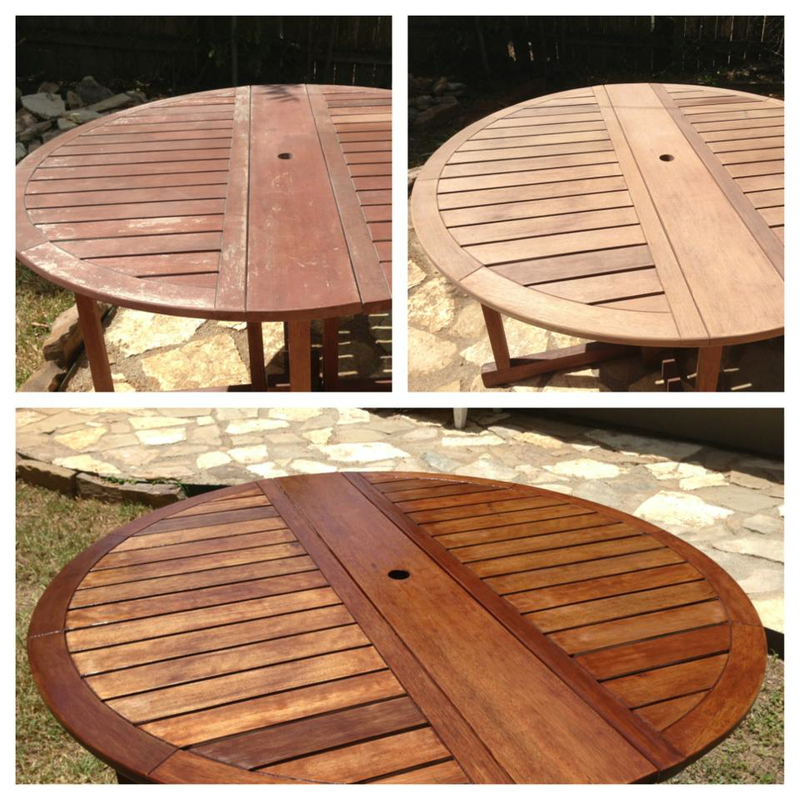 Once the stain completely dried, I applied a semi-gloss poly coating to protect it from the elements. It looks like a brand-new table again and cost me $0 because I already had the stain and sealer from other furniture projects. Once the rest of the furniture arrives, we're ready for a birthday celebration on the patio! I just have to purchase all the food, drinks and charcoal and make the birthday cake. What outdoor projects have you been working on this summer?